The first presidential primary debate will be held in Miami in June. 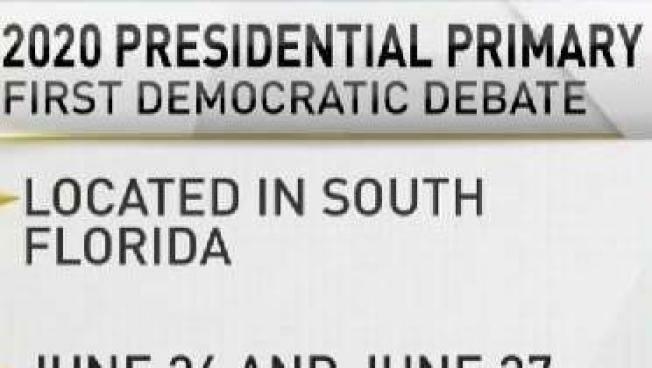 The first Democratic presidential debate of the 2020 election will be held in Miami in June, NBC News announced Thursday. The debate will take place on Wednesday, June 26 and Thursday, June 27. The events will be broadcast across NBC and MSNBC, as well as with real-time Spanish translations on Telemundo. Viewers in South Florida will be able to watch the debate on NBC 6 and Telemundo 51 on air and on their digital platforms. The debate will also be streamed for free across NBC News’ digital platforms, including NBCNews.com, MSNBC.com, NBC News Mobile App and other platforms, including Telemundo’s digital platforms. According to the Democratic National Convention, lineups for the debate “will be determined at random to provide each candidate with a fair opportunity to make his or her case to a large, national audience.” So far, there are at least 15 people running for president in the Democratic party. Details on the venue, moderators and timing will be announced at a later date, the DNC said in a press release.